THE 2013 MARATHON went down this past Wednesday and Thursday. 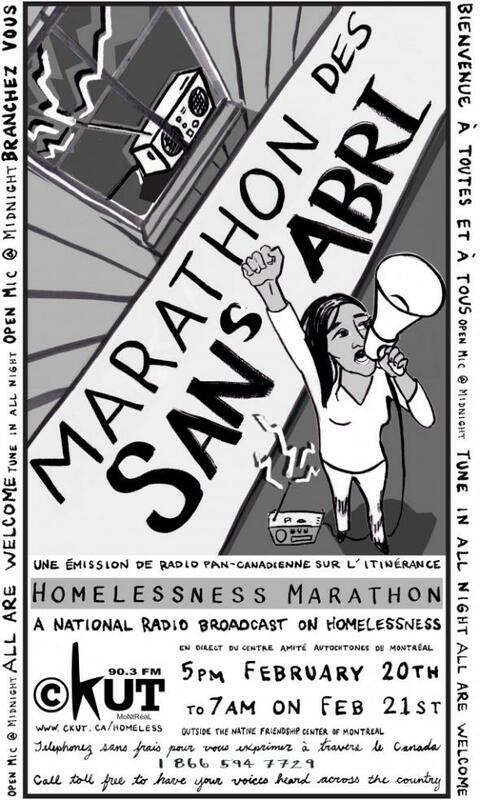 The eleventh annual Homelessness Marathon this year served up 21 hours of people-powered radio, broadcasting this year from multiple cities across Canada and hosted by 12 stations. With the goal of being a consciousness-raising event, the Marathon will provide an opportunity for homeless people and their allies to take to the airwaves, and allow a nationwide discussion on homelessness issues and possible solutions. Hour/Heure 9 (1am-2am) Coop Radio Vancouver and CKUT Montreal Host/ Animé par la radio Coop Radio à Vancouver, BC et CKUT à Montréal, QC (EN)] Violence Against Indigenous women; From Vancouver to Quebec and beyond: This issue is national. This issue is systemic. Speak OUT. For any and all information on the Homelessness Marathon go here: Homelessness Marathon website!!! Poster credit to the lovely, magnificent and talented Jesse Orr.